Do you have trouble making a clear distinction between a cleaner and a degreaser? Or wonder if there even is a distinction? If so, you’re not alone. 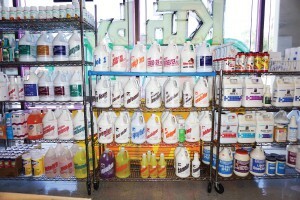 Various products may be labeled as an all-purpose cleaner, a degreaser, or a cleaner-degreaser. So what’s a cleaning professional to think? Both cleaners and degreasers have their place in a maintenance arsenal. Knowing when to reach for what will help make your cleaning job easier while keeping your facility safe and grime free. It’s the territory between cleaners and degreasers. In the industrial and institutional cleaning world, a degreaser is defined simply as a chemical product that removes grease. However some all-purpose cleaners may also remove some grease. Degreasers are a subset of cleaners, so all degreasers are cleaners but not all cleaners are degreasers.